Are you an AFFECTIVE LEADER℠? Do you easily build trust and make personal connections? Do you align mind, body, emotion and language to lead most effectively? Strong leaders have the ability to connect with people who will join them in changing the future. It is not only their words or titles that make the difference. It is mental and physical skills that create strong emotional (affective) connections. 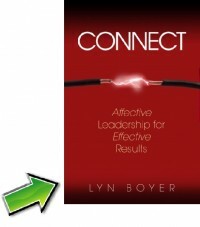 Because these essential leadership skills are often forgotten, Dr. Lyn Boyer has written Connect: Affective Leadership℠ for Effective Results. Whether you are in a formal leadership role or serving in an informal capacity, skills found in this book will make you more effective. In addition to thoughtful discussion of personal and professional learning, you will find activities for practice designed to promote mastery of these essential Affective Leadership℠ skills. I want you to know that you are very dear to me. Your book "Connect Affective Leadership.... " made a huge difference at the right time in my life to understand my own emotions and work with them in the leadership context. I'm an economist and made my career working for an international organization in Washington, D.C. in the areas of sustainable development, the environment and strategic planning. I'm now back in my country, Honduras, but before I came back I reinvented myself as a coach... Your book and my coaching training gave the perspective to see my life experience in a different context. I've always wanted to get in touch with you because the impact your book had on my sister and me. So: Thank You Lyn for sharing such a beautiful mind. We hope this book will be just as valuable for you. In addition, as a registered member of our community, you can use small portions of this ebook under Creative Commons licensing (with attribution, no derivatives) for your own audiences. You may use it professionally, but you are not granted sales authority. Please use the secure form below to purchase this valuable e-book for only $4.99. This offer is available only for members of this online leadership community.